Opening hours: The Viennese Heldenplatz and the outside facilities of the Hofburg buildings are normally freely accessible around the clock. The museums are open from 9:00 to 17:30 and in July and August until 18:00 o'clock. Tip: The Spanish Riding School is part of the Hofburg and famous for its Lipizzan horses. The morning exercises is a good opportunity to see the Lipizzaners live. Tickets cost about 15 Euro. The Hofburg Vienna (B2) is an impressive building at the Heldenplatz with long history. It is located at Vienna's splendor boulevard, the Ringstrasse, and is reachable from there through the Burgtor gate. The name of the Heldenplatz Vienna is based on the two magnificent horseman monuments which were created by Anton Dominik Fernkorn. In 1860 the horseman statue of Erzherzog Karl was finished and in 1865 the one which shows Prince Eugen von Savoyen was revealed. The specific characteristic of the Erzherzog-Karl monument is the horse which is jumping up and touches the base only with the hind legs at the base. From the 13th century until 1918 the Hofburg was the main residence (with a few interruptions) for the Habsburger and therefore also the residence for the emperor family in Vienna. Since 1945 the office of the Austrian Federal President is accommodated there and also the Austrian National Library, museums, the chapel Hofburgkapelle and the church Augustinerkirche. 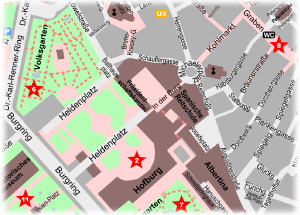 performance locations of the Vienna Boys Choir, the Spanish Riding School, the public accessible collection of the Silberkammer and the Sisi museum as well as the exhibition rooms of the Imperial Apartments. Exquisite porcelain, luxury table culture and the legendary Emperor Napkin are exhibited in the Silberkammer. In the Sisi museum you have the possibility to look after the traces of the famous empress Elisabeth in 6 different rooms with several original exhibits. 19 historical authentic equipped rooms are included in the Imperial Apartments where the emperor Franz Joseph and his Sisi have lived. At the Hofburg-Passage beside the Riding School you can find some nice souvenir shops and it leads to the Michaelerplatz. There you can have a look at two fountains with the motives -The Power at the Sea- from Rudolf Weyr and -The Power ashore- from Edmund Hellmer. From the Michaelerplatz you can go directly to the pedestrian zone (Kohlmarkt, Graben).